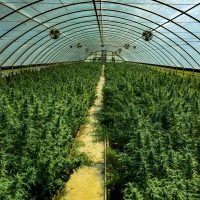 The U.S. hemp crop doubled this year, according to new survey data from a prominent hemp-advocacy group. Vote Hemp counted a total of 23,346 acres growing hemp in 18 states. That’s more than twice as much as hemp land as 2016, when the group counted 9,649 acres growing in 15 states. State licenses to cultivate hemp were issued to 1,456 farmers this year, according to Vote Hemp, and a total of 34 states have hemp laws on the books, though not all have started their pilot programs yet. The report also noted a slight increase in universities conducting hemp research, from 30 in 2016 to 32 this year. Vote Hemp President Eric Steenstra used the report to urge Congress to make hemp farming legal nationwide. Steenstra pointed out that hemp farmers face obstacles that include seed access that could be alleviated by federal expansion of hemp. A hemp bill has been introduced in the U.S. House, but it hasn’t been heard yet, making passage unlikely by the end of 2017. In neighboring Canada, where hemp production was legalized in 1998, an estimated 120,000 acres were devoted to hemp in 2017.